Last Thursday, a bridge collapsed over the Skagit River in Washington state, about an hour north of Seattle. I first heard the story on NPR, wedged between several other top-of-the-hour news bulletins. 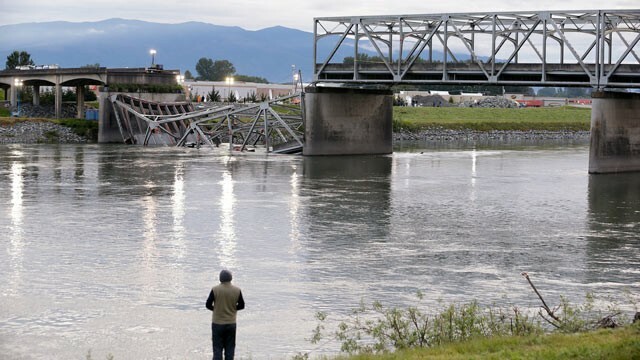 “A bridge collapsed in Washington state,” the radio said, no more details were offered. I immediately wanted to know more: a bridge collapsed? How? Why? What kind of bridge? Was anyone hurt? Is this common? As a commuter who crosses multiple bridges daily, this story out of Washington seemed to play on some of my worst fears — now all the infrastructure I had taken for granted was a possible death trap. But as I went about my day, waiting to hear emerging details of the collapse – the rescue efforts, the investigation, the government’s response – I was left in the dark. When I checked the New York Times website Friday evening, the story was buried in a small bullet point at the bottom of the page. Miraculously, I learned, no one was killed. 3 people were rescued, none injured seriously. Apparently the bridge was clipped by a truck carrying an oversized load, damaging crucial components of its steel truss design. This was somewhat reassuring news – at least the bridge had been faulted in some way and hadn’t just collapsed on its own. But still… is that all it takes? One slight error in a truck driver’s judgment?